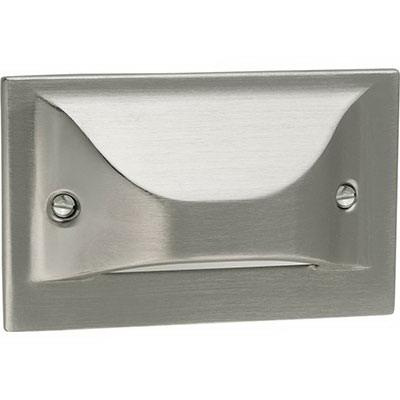 Progress Lighting LED Step Lights Collection 1-Light LED step light in brushed nickel finish, features heavy steel construction. This utilitarian/commodity style light uses one 4-Watt LED lamp. Lamp has voltage rating of 120-Volts. Lamp has color rendering index of 84 and color temperature rating of 3000K to ensure optimum light level in the surrounding. Lamp offers 65-Lumens of bright light output. Lamp comes with 50000 hours average life span to ensure uninterrupted service. It measures 4-3/4-Inch x 3-Inch. Light is cCSAus wet location listed and FCC Title 47 compliant.